This article is about the Austrian Dynasty. For the town in Switzerland, see Habsburg, Switzerland. Habsburg was a family of dukes, kings, and monarchs. They were very important in European history. They ruled Austria, later Austria-Hungary for more than 600 years. They also sometimes owned Spain, the Netherlands, and the Holy Roman Empire from about 1280 to 1806. A Treaty was made in Vienna in 1515 between the king of Poland and duke of Lithuania from the Jagiellon dynasty and the duke of Austria from the Habsburg family. It said that if the kings of Bohemia and Hungary, (Jagiellons), were to die without male heirs the Duke of Austria would take over their territory. They also ruled over the Kingdom of Sardinia. The House of Habsburg became extinct in the 18th century. The senior branch ended upon the death of Charles II of Spain in 1700 and was replaced by the House of Bourbon. 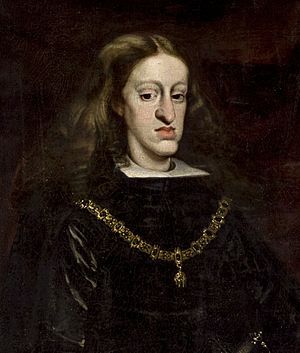 The mental and physical handicaps of Charles II were probably caused by inbreeding between relatives in the royal houses of continental Europe. Marriages of close relatives occurred for five generations before him. He was the son of Philip IV, who married his sister's daughter. The remaining branch went extinct in the male line in 1740 with the death of Holy Roman Emperor Charles VI and completely in 1780 with the death of his eldest daughter, Maria Theresa of Austria. 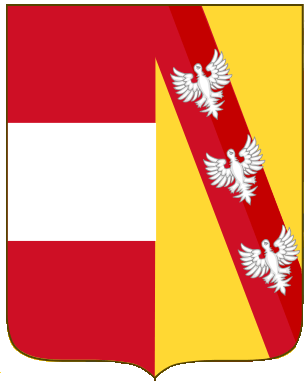 It was succeeded by the Vaudemont branch of the House of Lorraine. The new successor house styled itself formally as House of Habsburg-Lorraine (German: Habsburg-Lothringen), although it was often referred to as simply the House of Habsburg. The last empress was Zita of Bourbon-Parma. She died in Switzerland in 1989. She had ruled with her husband, Charles I of Austria, from 1916 to 1918. Growth of the Habsburg Empire in Central Europe. The Spanish and Austrian Habsburg Dominions in 1700, not showing their overseas empire, but showing the division between the Spanish and Austrian branch with their losses and gains. 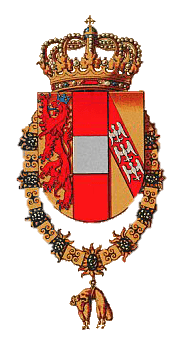 Middle Coat of arms of the Austrian part of the Empire in 1915. 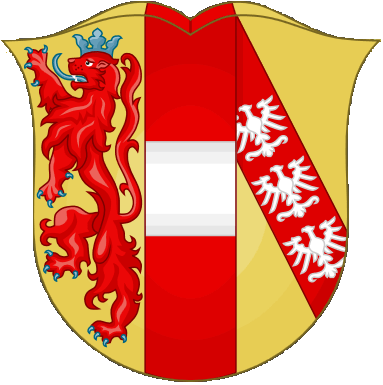 It shows as a center shield (inescutcheon) the personal arms of Habsburg-Lorraine over the arms of dominions of the Habsburg lands. It usually had the personal arms of Habsburg-Lorraine in the center. Middle Common Coat of Arms of the Austro-Hungarian Empire in 1915 showing most of the larger possessions of the Austrian Empire (left shield) and the Kingdom of Hungary (right shield). The personal arms of the Habsburg-Lorraines is in the center. The collection of territories that acknowledged the head of the Habsburgs as personal ruler shown by this representation put the Empire at a distinct disadvantage in comparison with the unified nation states that it shared the continent of Europe with. A map of the dominion of the Habsburgs following the Battle of Mühlberg (1547) as depicted in The Cambridge Modern History Atlas (1912); Habsburg lands are shaded green, but do not include the lands of the Holy Roman Empire over which they presided, nor the vast Castilian holdings outside of Europe, particularly in the New World. House of Habsburg Facts for Kids. Kiddle Encyclopedia.